Creating website wireframe with free templates and examples. Website wireframe has never been easier. 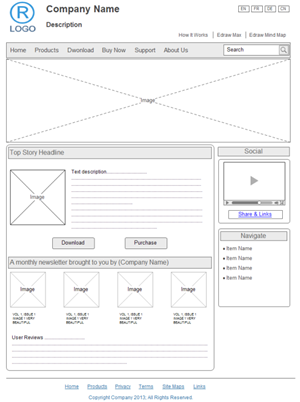 A website wireframe is also called a page schematic or screen blueprint. 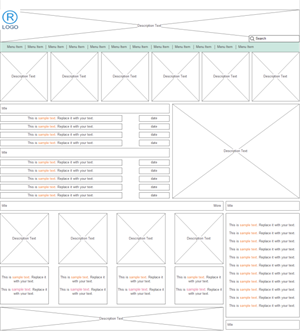 Wireframes are an important design tool used in web development. It is a visualization tool for presenting proposed functions, structure and content of a web page or web site. Websites wireframes are created for the purpose of arranging elements to best accomplish a particular purpose. With Edraw software, you can easily explain how users will interact with the Web site. If you've yet to use Edraw website wireframe software, it's time to get your feet wet. Edraw has a large collection of symbols and shapes that allow you to design your own website wireframe with free templates. All the symbols are vector-based, that you can change the size with free templates. The intuitive interface and advanced functions makes the whole designing process very simple, no complicated designing knowledge required. You can create a Website Wireframe in just minutes. This is a website design wireframe example for your reference. 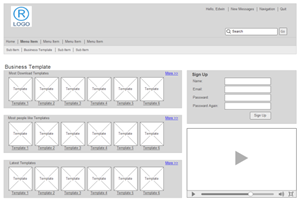 In our wireframe software, it takes only a few minutes to finish a wireframe like this one. Learn how to create wireframe. The right wireframe is for designing a web page that share images or diagram templates. It helps developers locate images, video and company logo neatly. 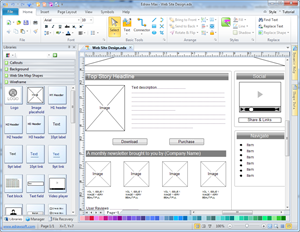 One more wireframe template is offered. It is suitable for social news website design. Click the picture to download it. See our built-in wireframe symbols.